A.J.A. Bruinsma - TNO Inst. of Applied Physics, The Netherlands. 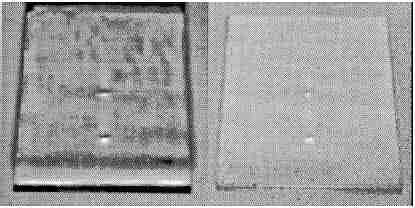 The D-Sight technique is an optical double-pass retroreflection surface inspection technique developed by Diffracto Ltd in Canada. It is a real-time technique for visualizing very small out-of- plane surface distortions and it is particularly applicable to the rapid and enhanced visual inspection of large surfaces. An evaluation of the D-Sight technique for the rapid detection and assessment of impact damage in composite aircraft structures is described. The viability, reliability, limitations and possible improvements of the technique are discussed. The work has been performed within the EUCLID framework, RTP 3.1 "Aeronautical Application Technology", Work Package 2 "Global Diagnostic Damage Detection Methods". A set of equations has been derived to establish the relation of various parameters of a D-Sight set up. To quantify the inspection results, a D-Sight index has been introduced which represents the contrast of the D-Sight signature of a defect. Image processing routines have been designed for automatic detection of defects from D-Sight images. It is concluded that the D-Sight technique can reliably detect significant impact damage, with a damage area equal to or larger than 5 cm 2 , within a field of view of about 0.25 m 2 . The sensitivity of the technique corresponds to indent depths in the range of 0.01 to 0.05 mm. Inspections on a full scale composite structure show that the D-Sight technique compares favourably with other inspection techniques, for the detection of impact damage and other defects with surface deformation. The work presented in this paper has been performed within the EUCLID framework, Research and Technology Project RTP 3.1 "Aeronautical Application Technology". EUCLID (European Cooperation for the Long Term in Defence) is an European defence research and technology cooperation initiative in which 13 European countries of the Atlantic Alliance are participating. EUCLID RTP 3.1 involved industrial partners from 8 different nations with Germany as lead nation. The work content of the 4 year project RTP 3.1 was divided into 3 research programmes (Work Packages). The present work has been performed within Work Package 2 "Global Diagnostic Damage Detection Methods". In this Work Package different damage detection methods have been considered: shearography, holography, thermography, fibre optics and D-Sight inspection. The general objective of this programme was the evaluation, verification and configuration design of global damage detection methods and systems for "on aircraft non-destructive inspection" of composite structures, which can fulfil the peacetime needs of the services in a most cost effective way. Inspection of flat or curved parts must be performed from the outside of the aircraft and without removing aircraft parts. The inspection methods must be quick and easy to use. The minimum one-view inspection area is 0.25 m2 . The EUCLID programme is focused on the detection of not clearly visible or non-visible impact damage. The minimum reliably detectable damage size is 5 cm2. This paper will give the results of the evaluation of the D-Sight technique. The objective of the work was the assessment of the viability, reliability, limitations and possible improvements for the detection and characterization of impact damage and other surface anomalies in aircraft composite structures. Two companies were participating in this programme: The National Aerospace Laboratory NLR and the TNO Institute of Applied Physics (TPD) in the Netherlands. D-Sight is an optical double-pass retroreflection surface inspection technique developed by Diffracto Ltd in Canada. It is a patented method for visualizing very small out-of-plane surface distortions such as indentations and protrusions. The principle of the D-Sight technique is well described in the literature (Ref. 2). The application of D-Sight for impact damage detection in composite aircraft structures has been addressed e.g. in Ref. 3. The D-Sight optical set-up consists of a light source, a camera, a retroreflective screen and the specimen (Fig. 1). The light from a standard divergent light source is reflected by the specimen. The surface of the specimen must be specularly reflective (specular reflection can be enhanced, if necessary, by wetting the surface with a thin fluid film). The reflected light then strikes a retroreflective screen which consists of numerous half silvered glass beads (typical diameter 60 µm). This screen attempts to redirect all incident light rays at the same angle to the initial reflection point on the specimen surface. However, the screen is not perfectly retroreflective and actually returns a diverging light cone instead of a single ray at the same angle. It is this imperfection of the retroreflective screen that creates the D-Sight effect. The light is reflected again by the specimen and collected by a camera placed slightly off-set from the light source. When the specimen is perfectly flat the camera sees the specimen with a uniform light intensity over the surface. An out-of-plane surface distortion, on the other hand, will result in local intensity differences. These intensity differences are caused by the imperfection of the screen because the light intensity returned by the glass beads is dependent on the viewing angle of the light cone relative to the incoming light ray. The result is that the surface distortion will appear brighter on one side and darker on the opposite side of the surface distortion, depending on the local slope of the surface. The process hence converts variations in surface slope to changes in light intensity (Ref. 2). As an example, in Fig. 2 the D-Sight image of a composite specimen with impact damage is shown. The D-Sight technique is in fact a simple reflection surface technique but it has the advantage that a relatively large surface area (flat or moderately curved) can be viewed real-time with a fixed position of the light source, camera and specimen. with: 0 the viewing angle for a flat or globally curved object ( 0 =D /(LL +LR )), the change in viewing angle caused by a difference between the local slope and the slope of the surrounding area, D the distance between the centre of the light source and the centre of the camera, LL the distance between the centre of the light source (or camera lens) and a point on the object, and LR the distance between the object and the retroreflector. The brightness of the observed area will be lower than the brightness of the surrounding area for > 0 and for < -2 0 (or > 0 and < -D/LL ). The brightness of the observed area will be higher than the brightness of the surrounding area for -2 0 < < 0 (or -D/LL < < 0). A maximum intensity increase will be reached for =- 0 (or = -0.5 D/LL ). Note: < 0 means a clockwise deviation of the surface slope. The D-Sight set-up has been modelled using a ray tracing program ASAP which can handle scattered rays. The model gives a good description of the D-Sight phenomenon and of the effect of e.g. the retroreflection diffraction angle, the size of the light source and the lens aperture. It is concluded that an indent with a maximum slope difference of at least 7.2 . 10-3 radians and with a diameter of 15 mm (with a depth of about 0.05 mm) will result in an intensity modulation with a high contrast. Two inspection systems have been used in the evaluation of the D-Sight technique: an experimental D-Sight system of which the parameters of the optical set-up can be changed (Ref. 5; Fig. 1) and a commercially available DAIS-500 system (Diffracto Ltd) with fixed parameters of the optical set-up (Refs. 4 and 5; Figs. 3 and 4). A 12 V, 50 W halogen lamp in a semi diffuse parabolic metal reflector with an effective width of 50 mm. A monochrome CCD camera with CCIR video output (mounted on a tripod). The CCD camera is coupled to a frame grabber to record the images on disk. A retroreflective screen consisting of 3M High Gain Screen material model 7610. The full width at half maximum (FWHM) of the intensity distribution of the backscattered light cone of this retroreflective material is somewhat less than 1°. Most parameters of the set-up such as LL ,LR , D, and ß (see Fig. 1) can be changed but the default parameters of the set-up were: LL = 1800 mm, LR = 500 mm, D = 50 mm, ß = 27° and the focal length of the imaging lens of the CCD camera: 25 mm. A rectangular inspection field of about 37 x 70 cm (0.26 m2 ) can be selected within the imaged trapezium shaped object field resulting at ß = 27°. D-Sight image acquisition sensor (Fig. 4), which consists of an enclosure with integral handles, a CCD camera, a white light source mounted slightly below the camera lens, a retroreflective screen with a protective coating, and glass mirrors to reduce package size by folding the optical paths. The enclosure blocks ambient light from illuminating the inspection area (ambient light reduces image contrast and sensitivity). The enclosure footprint is rectangular in shape; the effective inspection area is 36 x 76 cm (0.27 m2 ). Host controller, which consists of a PC/AT computer with an LCD VGA display monitor, keyboard, and disk drives. Pendant controller, with video display and touch LCD panel to provide control of the sensor functions at a remote location from the host. Flat graphite-epoxy laminates (with glass fabric surface plies) with a thickness varying from 1.9 to 9.1 mm, representative of the composite skins in the stabilizer parts of F-16 aircraft. The surface condition of the specimens was uncoated (rough or smooth) or coated with different paint systems. A Round Robin programme was performed within RTP 3.1 WP 2. Eight composite specimens of different structure and material and with different defect types and sizes (mainly impact damage) were circulated and inspected by the participating companies. The specimens included e.g. an A340 engine pylon fairing, an EFA fuselage stiffened panel and an AMX stabilizer panel. A Comparative Test on a full-scale composite structure was performed within RTP 3.1 WP 2 The inspections took place at IABG Ottobrunn (Germany) in June 1996. Twelve inspection techniques (or inspection set-ups), including the D-Sight technique, were applied on a NH90 helicopter rear fuselage from Eurocopter Germany. On one side of this structure, in an inspection area of approximately 2 m2 , 27 impact damages and honeycomb defects had been introduced by Eurocopter and IABG. The D-Sight method only operates if the surface of the object to be inspected is specularly reflective. In practice, surfaces may be finished with different coatings with a visual appearance varying from highly glossy to mat. To enhance the specular reflectivity of the surface a thin liquid film, called a highlighter, may be applied. The highlighter decreases the diffuse reflection and increases the specular reflection. However, macro roughness such as coating thickness differences and fibre structure in the surface layer will not be reduced by applying a highlighter and will consequently be visible in the D-Sight images. D-Sight measurements have been done both with and without highlighter. The applied highlighters were turpentine and M120 (Electron; trademark of Sentry Chemical Co.). with:(Imax/ Imin = the maximum/minimum intensity in the marked area. The so defined D-Sight index gives a good representation of the most significant feature of the D-Sight signature. Automatic detection of defects can significantly decrease the inspection time, as most of the time consuming work during the inspections, such as determining and noting down the positions of defects, can be skipped. Furthermore, the detection of defects would then not be dependent anymore on the skills of the operator to recognize the features of a D-Sight signature of defects. In Ref. 5 a preliminary image processing procedure is presented that was developed to recognize and indicate the features of D-Sight signatures that are specific for indents that result from impact. Furthermore, an attempt was made to ignore D-Sight signatures from all kinds of other disturbances of the surface. In addition, the procedure was designed such that the method is almost insensitive to background intensity and to local variations of the reflection characteristics of the surface to be inspected. The results of the experiments and measurements with the experimental set-up and with the DAIS-500 system are given in Ref. 5. An example of a D-Sight image of a composite specimen with impact damage is given in Fig. 2. A comparison of the D-Sight index values obtained with the two D-Sight inspection systems is given in Figs. 5 and 6. These figures give an overall picture of the capability of the D-Sight technique for impact damage detection. Surface curvature in the direction of observation leads to an extreme variation in the intensity along the surface, and to a severe reduction of the contrast in the D-Sight signature of surface defects. Curvature perpendicular to the direction of observation, on the other hand, does not (or in much lesser degree) lead to these disturbing effects. Therefore, when inspecting curved surfaces the D-Sight equipment should be orientated in such a way that the direction of curvature is perpendicular to the direction of observation of the D-Sight equipment. The contrast in the D-Sight signature of surface defects is strongly reduced as a result of environmental light. Shielding is therefore necessary when a D-Sight inspection system is to be used in the field. For the D-Sight inspection of highly glossy surfaces, application of a highlighter is not necessary. It can even reduce the visibility and D-Sight index value of indents. For the inspection of mat surfaces, application of a highlighter is necessary. With highlighter these surfaces are well inspectable. For the inspection of very rough surfaces, application of a highlighter is necessary. Even then, the detection of out-of-plane surface distortions can be difficult. The experimental set-up has a high sensitivity of inspection for the detection of out-of-plane surface distortions, but this sensitivity is non-uniform in the field of view. The DAIS-500 has a lower but uniform sensitivity of inspection in the field of view. The lower sensitivity is caused by the shorter object distance in the optical set-up and by the specially coated (for protection) retroreflective screen. Because of some advantages (integral package, insensitive to ambient light, reduced inspection time) the DAIS-500 may have a higher reliability of inspection for in-service application. The D-Sight sensitivity corresponds to indent depths in the range of 0.01 to 0.05 mm for the experimental set-up and 0.03 to 0.05 mm for the DAIS-500. Reliable indent detection during in-service inspection corresponds to indent depths in the range of 0.05 to 0.10 mm for the experimental set-up and 0.09 to 0.15 mm for the DAIS-500. Both inspection systems can detect significant impact damage (with damage size 5 cm 2 ) by applying a highlighter on the specimen surface and by observing the D-Sight image. Only for very rough surfaces there may be a detection problem. The concept of D-Sight index is a good indication of the relative damage size but it may be difficult in practice to select a uniform D-Sight index threshold for the detection of significant impact damage. The D-Sight inspections performed on a full-scale composite structure show that the inspection results of the DAIS-500 and experimental D-Sight set-up are comparable i.e. with an equal detection result for the significant damages larger than 5 cm2 . Both D-Sight inspection systems compare favourably with the other inspection techniques; only the phase-stepped shearography inspection by Steinbichler/IABG showed a better performance for damage detection (Ref. 5). A set of equations has been derived to establish the relation of various parameters of a D-Sight set-up. A D-Sight index has been introduced to quantify the inspection results. The sensitivity of the D-Sight technique corresponds to indent depths in the range of 0.01 to 0.05 mm. The D-Sight technique can reliably detect indents with indent depth in the range of 0.1 mm on smooth and glossy surfaces, and also on mat surfaces if a highlighter is applied. The D-Sight technique is capable of detecting significant impact damage, with a damage area equal to or larger than 5 cm2 , within a field of view of about 0.25 m2 . Inspections on a full-scale composite structure show that the D-Sight technique compares favourably with other inspection techniques, for the detection of impact damage and other defects with surface deformation. It is recommended to further develop image processing procedures for the automatic detection and analysis of defects (e.g. type and size) and for the comparison of inspection results with previously recorded results (e.g. during manufacturing). It is recommended to further develop software for the incorporation of the structure configuration and for the archiving of the inspection locations and inspection results. Erdl, M.; Woithe, K., "Specification of requirements", EUCLID RTP 3.1 reports EUC-DOC-2110/ 2120/2130-01-IABG, Ottobrunn, 1993. Reynolds, R.L. ; Karpala, F.; Clarke, D.A. and Hageniers, O.L., "Theory and applications of a surface inspection technique using double-pass retroreflection", Optical Engineering, Vol. 32, No. 9, pp. 2122-2129, 1993. Komorowski, J.P.; Gould, R.W. and Marincak, A., "Location of impact damage sites in composite aircraft structures", NRC/IAR report LTR-ST-1904, Ottawa, 1992. Diffracto Limited, "DAIS - D SIGHT Aircraft Inspection System", User's manual, Windsor, Canada, 1995. Heida, J.H. ; Bruinsma, A.J.A., "D-Sight method", EUCLID RTP 3.1 reports EUC-DOC-2610/ 2620/2630/2640/2650-01-NLR, Amsterdam, 1994.